Parmalat is on a never-ending mission to create top quality, delicious dairy products. To ensure that we can keep doing this, we adhere to Good Agricultural Practices (GAP). 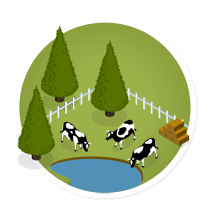 GAP is a systematic production approach that takes key farming and manufacturing practices into account; sustainable agriculture, environmental protection, food safety and animal health and well being. To ensure that all of our dairy products are the best that they can be, we make sure that every single one of our milk producers sign a declaration of adherence to GAP. rBST hormones are synthetic hormones that artificially stimulate milk production in cows. The suppliers of Parmalat milk warrant that no rBST hormones are used. From the freshness of our dairy products, to the systems and practices on the farms that supply them; we’re constantly looking for the best and most innovative possible ways to add more value, taste and quality to everything that carries the Parmalat name.